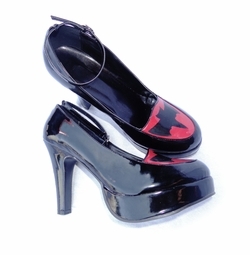 Planning to be a Plus Size Bat Girl or Bat Woman this Halloween? With this dress and kit you will have everything you need! The dress is a simple black black crush velvet dress, nice & long at appx 54", straight cut, with no sleeves, and cut corners at the bottom, but is also available extra long/tall as a special order. The bat wings, bendable and made with a thin tulle, spread at about 70 inches in length. They have elastic for the arms to slip through and wear on the back. Order the dress with our Basic Accessory Kit or UPGRADE to the Deluxe Kit for $19.99! You also have an option to add a beautiful black & red bat wig!